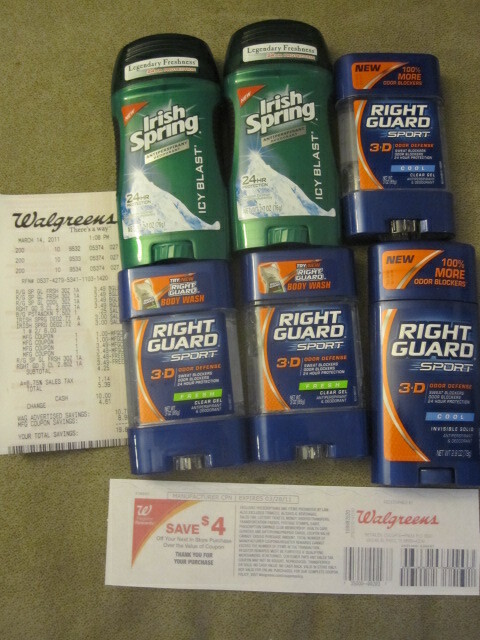 Walgreens Trip 3/14/11 ~ Free Deodorant! March 14, 2011 · by Zack & Katie · Post may contain affiliate links. See my disclosure policy here. Well, I am breaking my boycott of Walgreens to bring you some great deals! Walgreens is tricky with their register rewards program, but I am going too start posting their deals anyway. I am also going to be focusing more on the major players in the "extreme" couponing game: CVS, Rite Aid, Walgreens, Target and Wal Mart. I will explain the major changes to the website in a post in the near future. 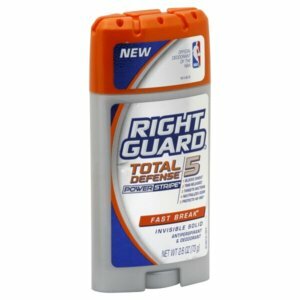 Note: some people have this deal posted with Right Guard deodorant types that would not be free. The ones that look like the one below were $4.99 in my store, and the coupon is only good up to $4.49. Try and find the ones in the picture above. Of course, I got flack for using the BOGO coupon on a BOGO sale, I kept my cool and had the checker ask someone else, who said it was okay. Always be ready for this when using a BOGO in a BOGO. I also found some freezer clearance and bought one Budget Gourmet frozen meal for $.25. I have been reading your blog since december and I am happy to see you now have wags too. I know wags is harder to deal with, but some of the deals are too good to miss. Waiting to read about your shopping at wags and see what good deals you find. I hope they are not going to give you a hard time.